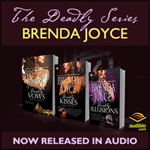 Brenda Joyce is a New York Times and USA Today bestselling author of more than 49 novels and five novellas, including the bestselling de Warenne Dynasty and Masters of Time™ series. Her first novel, Innocent Fire, won a Best Western Romance Award from RT Book Reviews. She has also won a highly coveted Best Historical Romance award for Splendor and two Lifetime Achievement Awards from RT Book Reviews. There are over 14 million copies of her novels in print, and she has been published in more than a dozen countries. A native New Yorker she now lives in Arizona. Brenda divides her time between her twin passions—writing powerful love stories and showing her reining horses. Read Brenda’s latest letter to her fans here. Enjoy the selection of videos showcasing Brenda’s other passion.